AC Safe? Supports transfer the weight of the air conditioner from the window sash and sill to the support and window frame. Install the support into the window and then place your air conditioner onto the support. The result is a more secure installation with minimal chance of damage to the window, window parts or outside wall. Exclusive bubble level sets proper angle for condensation runoff. Includes English, Spanish and French instructions and all necessary installation hardware. Easy indoor installation eliminates all exterior work. Increases safety and lessens chances of an accident. Constructed for long service life - heavy gauge, epoxy coated steel with stainless steel hardware, nylon fixtures and neoprene rubber mounting pads. The nice thing about this bracket is you can install it from inside without getting on a ladder. The bad thing: It probably won't fit on your window. The design requires that you have a window sill (not all windows have one) which extends for a certain length - not too much or too little from your outside wall. It also requires that your window not extend to high above the sill (vinyl windows have a border which seems to be too high). You will be able to install the bracket. The problem is, the hinged support underneath won't reach your outside wall. Or, if it does, the angle will be too shallow to provide adequate support. Or you may get lucky. 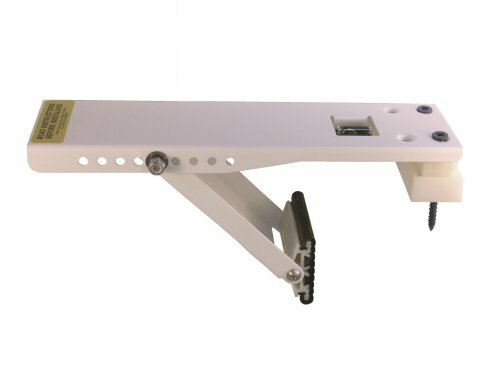 I bought two of these and it wouldn't fit properly on either apartment where I tried to install it. (the fit is hard to explain, which is probably why they didn't). Does your window have a sill?